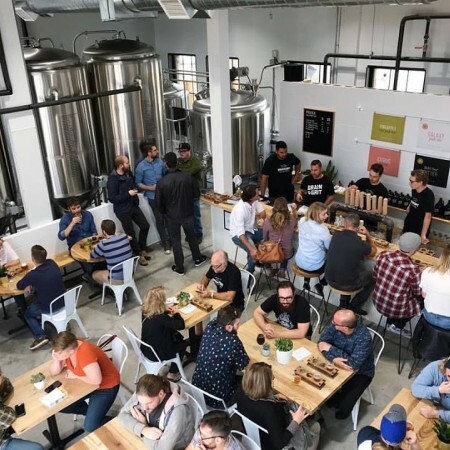 HAMILTON, ON – Grain & Grit Beer Co. has announced that it will be opening its taproom and retail store to the general public tomorrow (Tuesday October 17th) for the first time. Founded by Joe Mrav, Lindsay Mrav, and Alex Sporn, Grain & Grit launched its first beers at the Brantford Beer Fest in early September. A soft opening of the taproom took place over the weekend for Founding Members who contributed to the brewery’s crowdfunding campaign earlier this year. Beers set to be available at tomorrow’s opening include Breakfast Stout, Citrus Saison, West End IPA, Galaxy Pale Ale, Bob’s Best Bitter, and Pineapple Rye Pale Ale. Grain & Grit is located at 11 Ewen Road in West Hamilton. For more details, see the Grain & Grit Facebook page.